Please note that this book review has been provided by Colin Gordon. David Davis’s civil servants now routinely instruct business leaders coming to Whitehall to lobby or advise the Brexit Secretary that they are to speak about our coming exit from the EU only in upbeat terms, saying they are “very excited about the possibilities”. The Prime Minister, after all, has made it clear that “Brexit is Brexit and we will make a success of it”: suggesting that we won’t make a success of Brexit is now almost as much a heresy as querying what Brexit is or why it is a good idea – and may, in addition, not be good for the increasingly fragile morale of Mr Davis. 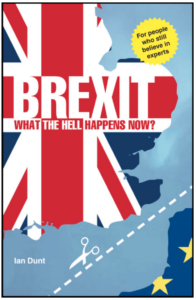 We learn this from journalist Ian Dunt’s book “Brexit: what the hell happens now” – a timely, compact and punchy new book which richly delivers on its title’s promise. Its core is a quite detailed map of the various economic hells into which the “people’s will”, as expressed on June 23rd 2016, has the potential to propel us. It offers a costed menu of the options, with their respective challenges, downsides and (relative) bonuses. It explains the Norway option, the Swiss option, the Canadian option, the Turkish option: in or out of the Single Market, in or out of the Customs Union, and (if we end up out of both) the fiendish pitfalls of the so-called WTO option. None of these options, Dunt shows, promises us any net gain in our sovereignty in dealing with the outside world. It is much more likely to be the reverse: we will get to have rules imposed on us, through grinding attrition and outmanoeuvring by other, stronger and smarter economic players. (Norway used to get its trade regulations sent from Brussels by fax; nowadays it downloads them from the Brussels website.) And as things stand, the UK state doesn’t actually have more than a handful of trained people who know how to negotiate, over period of years, such colossally complicated trade deals. The book is written for the general public, not officials or academics, but it takes the reader some way into the depths of devilish detail and fiendishly tangled process which lie in store. It looks at the complexity and hazards of some specific challenges, like the future of animal welfare and veterinary safety standards in our abattoirs. Dunt makes the point that we will not only stand to pay a massive economic price (via exclusion from the Single Market) to regain our coveted, unrestricted power to keep out EU migrants: we will also pay a further price – in growth, jobs, tax revenues, services – as soon as we start using that power to indulge our taste for greater ethnic uniformity. It’s scary to realise, as one quickly does, that anyone who has read Ian Dunt’s book is likely to have a much better grasp of Brexit than any of our current Brexit ministers. No less scary is the staggeringly vast, intricate and expensive reconstruction the UK state, law and governance which leaving the EU will require us to execute. Instead of a bonfire of regulations, we’ll be having to write a whole new set for ourselves (even while exporters still have to comply with the EU’s ones), plus hire and pay for dozens of new regulatory agencies – each one a national replica of a current European agency – to administer and police them. Implementing Brexit will be the greatest, and probably longest peacetime state project in UK history – as Dunt says, it practically amounts to ‘making a new country’. It may very possibly have to be conducted alongside the dismantling of our Union itself. This is going to demand a level of political and administrative capability well beyond either the depleted resources of our state, or the meagre talents of our current rulers. There will be the cost, and also the opportunity cost – in other words, we won’t have much time or energy to spare for renewing our society or economy while we are kept busy at the task of reinventing its gloriously independent separateness. If that doesn’t sound he most rewarding project for the nation’s future over the next 10 or 15 years, reading this book is a useful basic training for the challenge of taking back control of our future from the incompetent team now in change. It might also just help ensure that our people and their MPs will muster the wit and courage to check seriously whether whatever the hell the least-worst Brexit is that’s eventually going to be proposed to us, isn’t a hell of lot worse then what we currently have at the moment… and then, having made that comparison, go on to reconsider (as we most probably could, even to the last minute) stepping off the A50 process and staying alongside our European democratic neighbours to stand together against the tide of fascism.